8/14/2012 – That is the headline of an obituary in his home newspaper, Tribune de Genève. 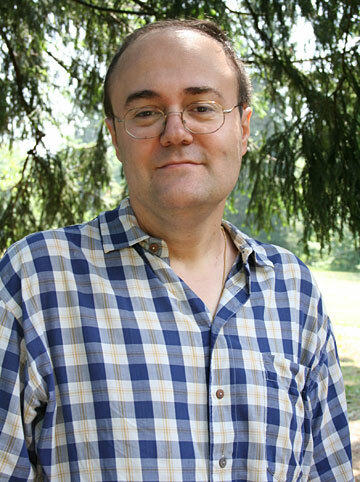 The news that shocked the chess world was that Olivier Breisacher, 44, who had just finished running the 2012 Biel Chess Festival, had suffered a swimming accident during a vacation in Majorca. He was flown to the University Hospital in Geneva, but his life could not be saved. Eulogy by Pascal Simon. In moments of pain and grief it is difficult to find the right words. With the death of 44-year-old Oilvier Breisacher the chess world has lost one of its driving figures. 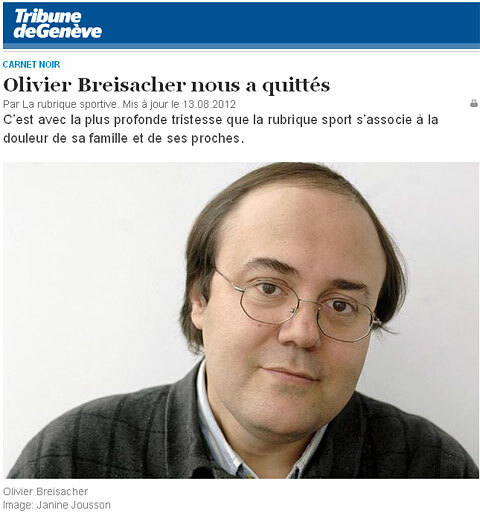 The Bieler journalist, working for a local newspaper (Tribune de Genève) in Geneva in the department of sport, was one of the organizers of the Biel Chess Festival. For more than 15 years Olivier looked after the organisation, reporting and external communicationsaround the grandmasters tournament in Biel, the flagship of the annual festival. 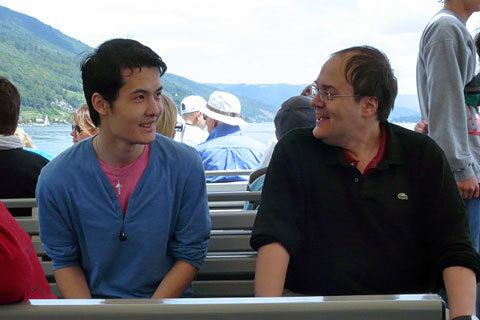 Through his excellent contacts in the chess world and the right instinct for the needs of the players he succeeded, year after year, to set up an interesting field of competitors. We owe the participation of Magnus Carlsen to Olivier. When you saw him chatting with the grandmasters, he was always surrounded by an aura of joy. He always had a smile on his face, and he knew how to deal with the great personalities of sport. This made him very valuable in his daily work. He devoted a lot of time to ice-hockey, and especially to the team of Servette Geneva. Most recently, he travelled to the European Football Championship, which took place in Poland and Ukraine. The tennis Grand Slams were something like a home for Olivier, and the personal highlights of his work were the one-on-one interviews he conducted with his sporting idol Roger Federer. Whether in Melbourne, Paris, London or New York, Olivier met with all the great players during the past decade. When he told us about his travels and adventures we always listened eagerly to what he has to say. His detailed knowledge of the subject matter was amazing – the meticulousness and professionalism Olivier displayed will not quickly find its match. "Olivier was the soul of the International Chess Festival" says Peter Bohnenblust in the Journal du Jura. He clearly enjoyed pulling the strings in the background, making the chess festival to what it is today. Biel became one of the highlights in the yearly chess calendar. And he showed how it can be done: the games broadcast live with GM commentary on the Internet, you can listen to the analysis of the players after their games, photos, videos, interviews and radio reports are readily available during and after the rounds on the homepage. Among the participants and visitors of the festival Olivier was a very popular figure. He liked talking to people and had a great sense of humour. At the same time he was very concerned about the well-being of the participants. If something was wrong, Olivier would find out about it and resolve the matter. 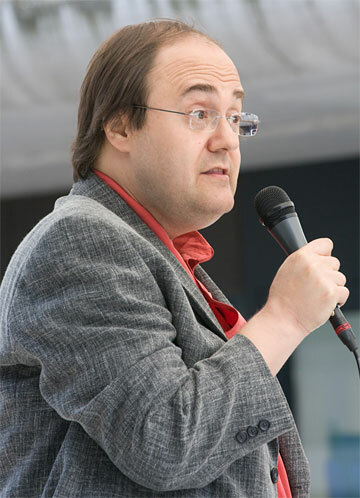 In the past four years I have been working at Olivier's side, helping with the Internet broadcasts and filing reports for the ChessBase news pages. I learnt to appreciate his collegial and open demeanor, the way he would listen to his colleagues and actively seek advice from them. There was plenty of discussion and controversy over the 3-point scoring system, the Sofia draw offer rules, the tournament mode and time controls. It impressed me to see that he was ready to take risks and not afraid of trying new ways. I will remember Olivier as a generous and extremely likeable personality, and I am shocked that he went so soon from us. Our thoughts are with him and we offer our deep condolences to his family. Rest in peace Olivier!